Stations: Gladesville, Ryde, Eastwood & National Crime Authority ( NCA ), Homicide Squad, Lecturer at Detectives Education Program, ? Beloved husband of Masami and father of Mia. Loving son of Pamela and Karl. 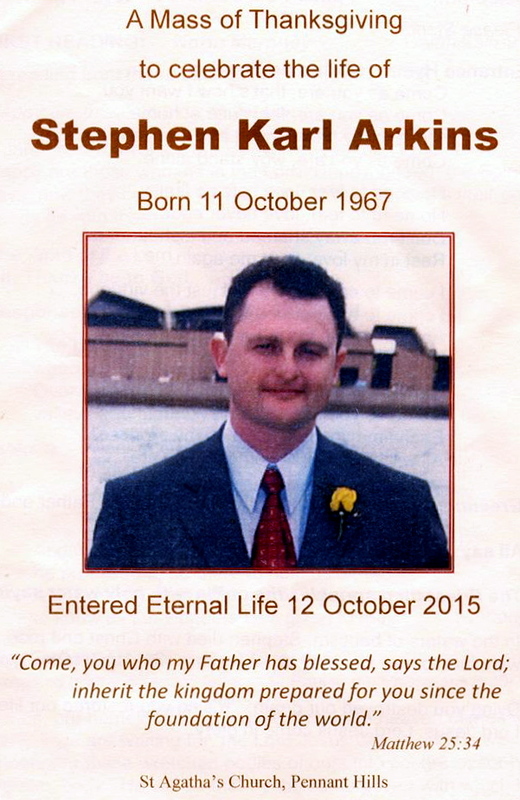 Brother of Kerri-Anne, Margaret (deceased) and Colleen. St. Agatha’s Church, Boundary Road, Pennant Hills on Tuesday October 20, 2015, at 12.00pm. My profound condolences. It was a pleasure to know him and an honour to serve with him. RIP mate, may there be a fair wind at your back for your journey into the home port. My deepest sympathy to Masami, Mia,Pamela ,Karl and family. My prayers and Mass will be offered for you all in this sad loss. Not completely sure but i think steve was in initial class 236 and completed DEP in 1994?